Addressing all the areas of your financial plan combine to achieve the ultimate goal of Financial Independence, that is, the ability to live a desired lifestyle and do whatever you want to do without being forced to create earned income. It certainly does not mean you need to stop working. It just means you don’t have to or you can work in any way you choose. And most importantly, living a peaceful and secure state of mind that frees you to sleep at night. Because making a decision to act in one area may have an adverse impact in another area, we believe that knowing all the consequences of each decision is the only way to give you the confidence necessary to act in accordance with all your goals and objectives. 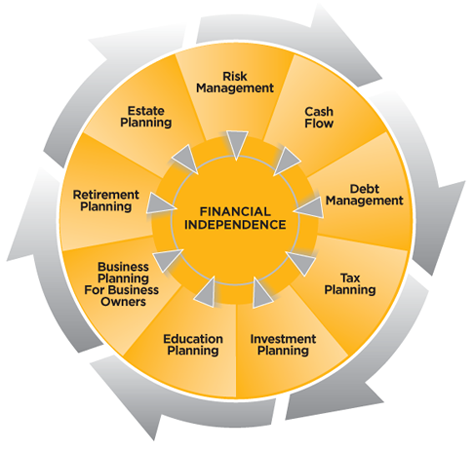 Click on any of the spokes of the Financial Planning wheel graphic for details about each “part of the whole”. Interested in exploring how a Comprehensive Financial Planning Approach might look for you?